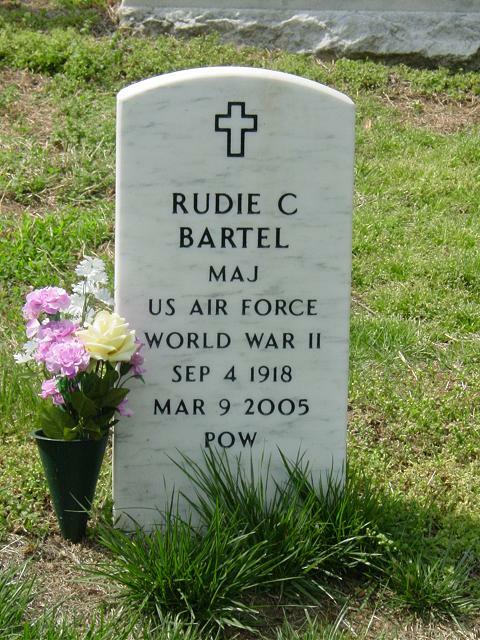 Rudie C. Bartel, 86, a retired Air Force Major who was a prisoner of war during World War II, died of congestive heart and renal failure March 9, 2005, at North Arundel Hospital. He was a resident of Bowie, Maryland. Major Bartel, a native of Comfort, Texas, always wanted to fly. He graduated from Air Force Navigation School and flew in World War II in Europe with the 492nd Bomb Group after being trained in the United States and abroad. He served in both the 5th and 8th Air Forces. On June 20, 1944, his B-24 bomber was shot down over Politz, Germany. He was a prisoner of war at Stalag Luft III and later at Stalag Luft VII in Moosburg, Germany, near a concentration camp. The POWs were rescued by General George S. Patton Jr.'s Third Army on April 29, 1945. Major Bartel returned to Comfort to recuperate but later was recalled to active duty. He served in the United Kingdom and then in Japan from 1958 to 1962, before becoming part of the Strategic Air Command based at Westover Air Force Base in Massachusetts. Major Bartel retired in 1962. He then worked for a short while with National Scientific Labs in Washington and the Census Bureau in Suitland. He became an electronics and aircraft engineer and computer operations division manager at the Pentagon before retiring again in 1988. He was a donor to the National Electronics Museum in Linthicum and enjoyed automobiles, reading and doing research. His wife, Shirley Mae Richardson-Bock, whom he married in 1948, died in 2004. Two sons also preceded him in death, Timothy Bartel in 1976 and James Randall Bartel in 1998. Survivors include seven children, Richard C. Bartel of Bowie, Steven J. Bartel of Lusby, Michael R. Bartel of Crofton, Sharon K. Hazel of Oviedo, Fla., Betty J. Dorr of Ferndale, Marjorie A. Clark of Los Altos, Calif., and Mary K. Bartel of Bowie; 11 grandchildren; and six great-grandchildren.